Netflix started off years ago as a company that mailed out DVDs for people to watch comfortably in their homes. When CEO Reed Hastings got the news that the company had shipped its one millionth DVD, there were no fireworks, no congratulatory pats on the back, or celebration video to go viral on social media. Instead, Hastings recalls, he drove up to a nearby Denny’s and enjoyed a steak by himself. Today, the company boasts 75 million subscribers worldwide, and in North America alone the company accounts for a huge portion of Internet traffic. Around the world people are firing up their laptops, consoles, tablets, and smartphones to enjoy both gripping original content as well as familiar favorites. It’s a formula that the company is proud of, and one that it’s dedicated to without question. Netflix was the first to pioneer “binge-watching,” and Hastings lightly compares this phenomenon to reading a book. You could pick one up and read a few chapters, put it down for a while, and then come back and pick up where you left off. It’s the sort of experience Hastings wanted for Netflix, and it’s this analogy that fuels the company into constantly improving the service behind the scenes. It does this on an almost daily basis without any of its users being aware of what’s going on, and it’s this stealth-like dedication to user experience and performance that keeps Netflix’s subscribers firmly dedicated to the service, year on year. You would think that if Netflix was going to be testing anything out, they’d target their current subscribers. But in reality, the company’s target population are those users who are currently on a free trial. This test group will then be split into two groups dubbed A and B, and subjected to slightly different versions of the service. One group may see a different image placeholder for a show, or might have a different font size, or color- whatever the difference is, the data is recorded and analyzed furiously. The company closely monitors how many members go from a free trial to a paid subscription– even if 0.2% of a target group become full-time subscribers, it’s an indication that whatever change that group was exposed to was a success, and it’s then rolled out to the rest of the user base. It’s what Todd Yellin, VP of Product Innovation at Netflix, does day in and day out, constantly monitoring results and analyzing user behaviors. As a purely visual service, images play a huge role in how Netflix displays content. The service will regularly test different images for a show in the UI, and again closely monitor which images lead to subscribers clicking on a show for more information or to watch. Images are different across countries as well– one image might do well in Europe, while another image for the same show is shown for North American audiences. With a typical test pool of around 300k and approximately 200 A/B tests being carried out a year, there’s ample amount of data to tell Netflix what works and what needs changing. While Netflix has broad categories to sort its content, most subscribers will have noticed that over time they get very specific genre recommendations in their UI. Things like “Movies With A Strong Female Lead” or “Road Trip Comedies” don’t seem like categories that a bunch of coders would dream up, so who’s behind them? The answer lies with Netflix’s group of “taggers”– around thirty people scattered around the globe who tag every piece of content on Netflix with certain keywords and attributes. The important point is that every tagger is unbiased, so content is tagged fairly, whether the tagger personally enjoyed watching it or not. There are around fifty thousand of these quirky genres on Netflix, and their most important role is to give context to what’s being recommended by the service’s numerous algorithms. Watching a lot of House Of Cards? You may see recommendations such as “Dramas Set In Washington D.C.,” for example. Netflix’s goal isn’t just to recommend other comedies just because you like comedies, but to drill down and find out what exactly it is that you enjoy watching, resulting in a truly unique and personalized viewing experience– whether you’re aware of it or not. 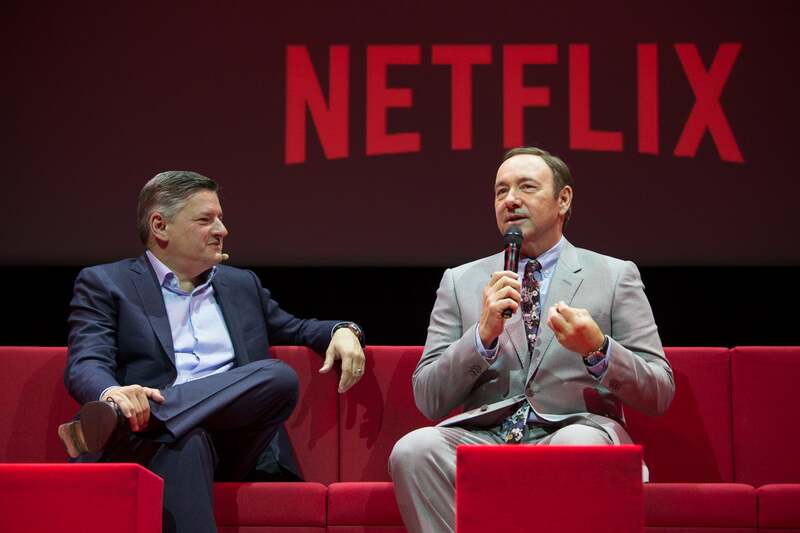 Netflix Chief Content Officer Ted Sarandos with House of Cards actor Kevin Spacey at a Netflix event in Paris, France in April 2016. Image credit: Netflix. For Netflix, detecting and recognizing viewing patterns is an intricate and important element to ensuring that the right content is being recommended to its users. Which is why the company employs up to fifteen different algorithms that analyze viewing data and subsequently recommend content to watch. But it isn’t just machine processing that helps with the recommendations– for every person who watches Netflix, the company has what it calls a sort of “taste doppelganger.” That is, someone with very similar (and sometimes the same) viewing habits as another user. These users are often grouped together along with their location information, so if one person in the pool watched a particular movie after watching a particular TV show, chances are that other users in that pool will want to do the same, so Netflix will show that recommendation first. Similarly, it’s able to process what shows other people in the same geography are watching, so there will be times when you could be recommended a program you never thought of watching. It’s this constantly changing pool of tastes that helps Netflix content reach a truly global audience. The show Narcos for example, is set and shot in Colombia, but is hugely popular in Germany– something that organically happened as the service recommended the show and more users started watching. It’s not 100% right all the time, and occasionally you’ll see a weird recommendation show up, but that’s only because someone in your pool actually ended up watching that. Technology is hugely important to Netflix and the company regularly tests new codecs and streaming methods in order to ensure that content is delivered at the highest quality possible with the least amount of bits. It’s an evolving mechanism that helps the company decide what its users want to watch yet, sometimes even before they know it.